Deck the porch, deck and patio this holiday season! 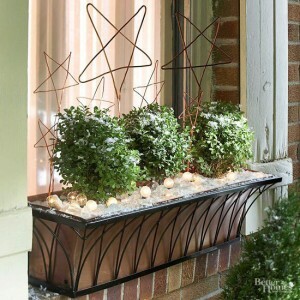 With a little imagination, it’s easy to go beyond simple string lights for your outside decor. Here are just a few ideas to keep your holidays merry and bright, inside and out. 1. Dress Up Those Porch Rockers. 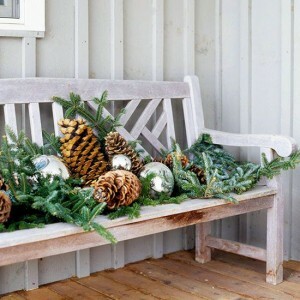 There are lots of ways to to let your porch say “Happy Holidays.” Try holiday greeting pillows placed on the seat or plaid blankets thrown across the back of your rockers. Add a table top tree nearby for added holiday flair. 2. Say It With Sleds & Skis. 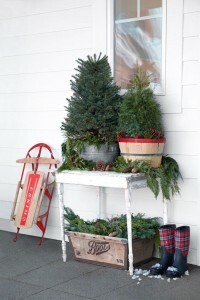 Nothing says winter fun like sleds and skis and both are simple to decorate! Add string lights and ribbons in the colors of the season or just pile in front of your wreath-adorned front door for some Christmas cheer. They will bring a smile to the faces of everyone who sees them. 3. Make A Merry Mailbox. 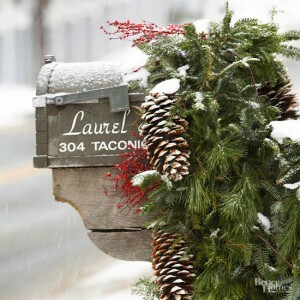 A bit of pine tied on to the mailbox with a few colorful accents will say “Merry Christmas” to everyone passing by. Not to mention that your mailman will enjoy it, too. 4. Wintery Window Boxes. Take the fall flowering plants out and fill those window boxes with pine, boxwood or miniature dwarf spruces. Add pinecones, ornaments or whatever else strikes your fancy. 5. Brighten Up a Bench. 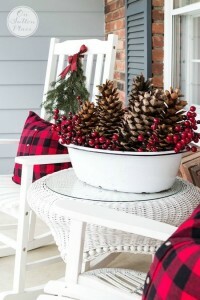 Give your porch or garden bench some holiday spirit with an arrangement of greenery, pinecones, and ornaments. Spray the arrangement with a light dusting of fake snow for extra winter flair. One of the best things about decorating outside is that long after you have taken down the tree and holiday mantle decorations, you’ll still have a celebratory look outside which will brighten your home all winter long.